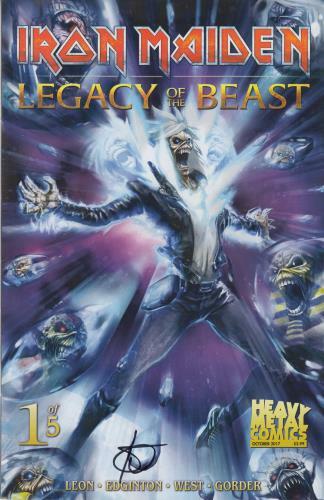 IRON MAIDEN Legacy Of The Beast #1 - Cover A (2017 US comic book based on Maiden's mascot Eddie. When dark forces conspire to corrupt the fabric of reality, Eddie�s immortal soul is shattered and strewn across the cosmos, his unbound essence corrupting countless worlds. Now, a weakened, primal Eddie must journey across space and time to battle the twisted legions of The Beast, seek out the lost shards of his soul, and bring order to the realms. This edition features cover variant A by Kevin J. West, and is signed by author Ian Edginton in a black pen. This example remains in a fantastic 'near as new' condition).